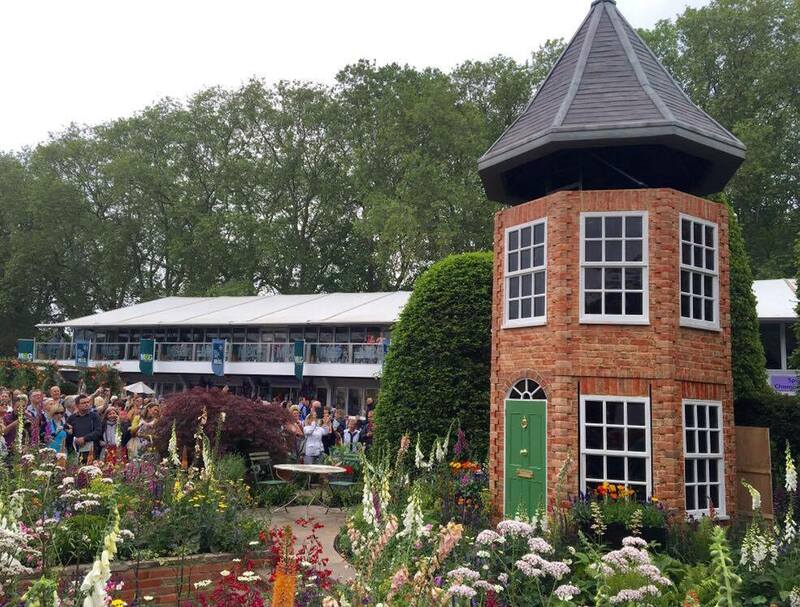 On Saturday 28th May, P&W’s Studio Manager, Holly, attended Chelsea Flower Show for the first time. Not being a ‘green-fingered’ individual, she was unsure whether the event would particularly appeal to her (the tickets were a Mother’s Day present for her garden-fanatic Mum!). However, Holly found that much of Chelsea Flower Show was about creating ‘theatre’. Dramaturgy was created by using elements like flowers, trees, grasses, herbs, seating areas, ponds, archways, sculptures, water features and patios (instead of set pieces and painted backdrops). Instead of creating a set from which actors perform a scripted play, gardeners and horticulturists were presenting at the show to express the intention behind their gardens, which ranged from drawing attention to political, medical, environmental, social and economic subject matters. Having studied Costume and Performance design, creating drama appealed to Holly’s penchant for theatre and costume design. Here is her countdown of Holly’s top 5 picks from the event. “I thought Dairmuid Gavin’s ‘The Harrods British Eccentrics Garden’ summed up the idiosyncrasy of Brits and more specifically, British artists and designers. 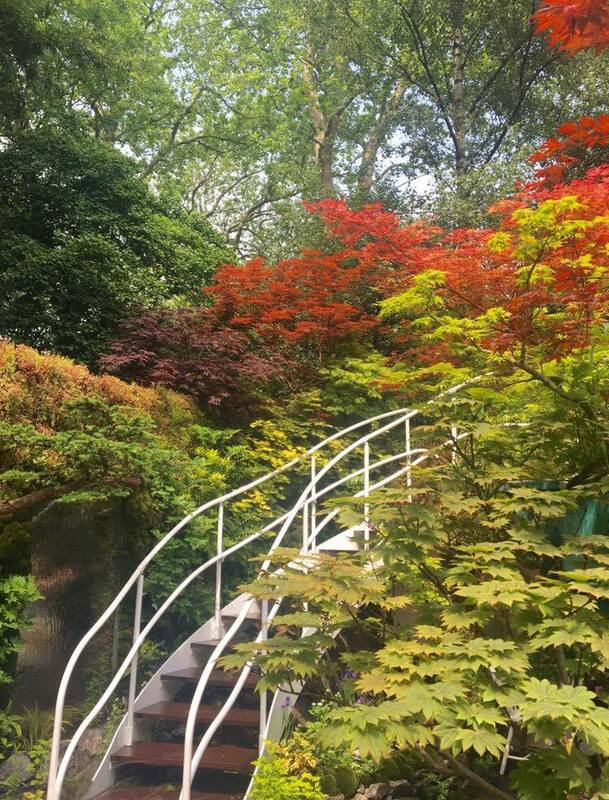 For me, garden designers unquestionably fall into the category of ‘artists’, and we are all aware that British artists are some of the most talented yet eccentric personalities on the planet (I’m thinking from Vivienne Westwood to David Bowie). 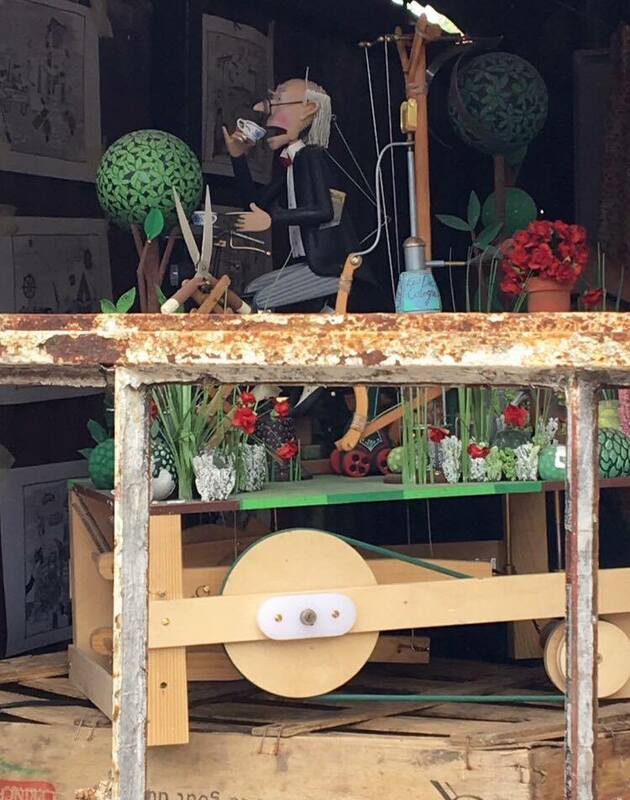 Gavin’s garden was inspired by kinetic sculptures and elaborate, over-the-top machinery performing simple tasks. I thought it was very Willy Wonka-esque. 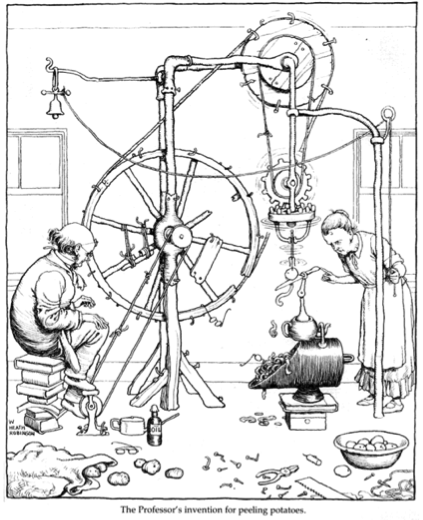 In reality, not Willy Wonka but another ‘Willy’, William Heath Robinson, was actually a source of inspiration for Gavin. He is referred to as an “unsung hero of British eccentricity and innovation” and is well known as ‘The Gadget Man’. Robinson designed fantastically complicated machines, for example this ridiculous potato peeler (which really appeals to my sense of humour). The garden, as the name might suggest, was sponsored by Harrods and featured a terrace that lead to an octagonal folly. At first glance it appeared to be a simple yet vibrantly coloured country cottage style garden full of lupins, roses and foxgloves so I was shocked when the garden began to ‘dance’ and came to life. Box hedges popped up and down, topiary bushes spun around and circular beds rotated. Even the roof of the building and the window boxes raised and lowered. The crazy performance took place every 15 minutes. Despite all of these elaborate animatronics, my favourite aspect of the garden was the ‘shack’ at the end, which contained simple yet intricate (I know this is an oxymoron!) wooden automatons. “The ‘Meningitis Now Futures Garden’, designed by gold-medal winning designer and landscaper, John Everiss, was really poignant. Inspired by “the spirit and energy of families whose lives have been irrevocably changed by meningitis”, the garden “celebrates the courage, determination and positive outlook of young people who have faced up to, and overcome, the consequences of this devastating disease”. I actually got a chance to speak with the very enthusiastic Everiss and he shared with us some history surrounding meningitis. 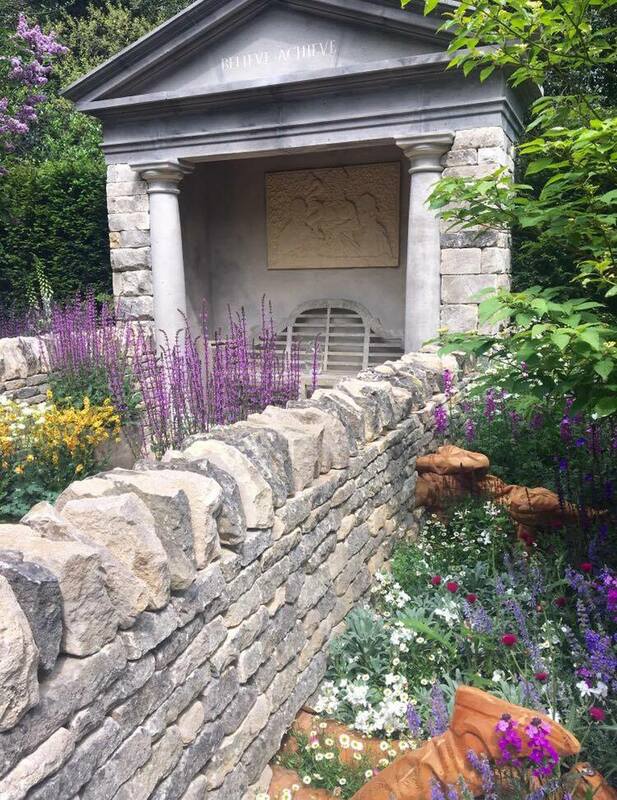 A major outbreak of the disease led to the first patient group (and later, the charity) being formed in Gloucestershire, which inspired the exhibit’s setting as a Cotswold country garden. An impressive and prominent Greek-themed, columned building formed the centrepiece which represented charity (a seat within the structure was inscribed with the charity’s motto). To each side of this structure were two walls, one representing the disease and the second, recovery. Five sculptures were distributed across the garden depicting “lives changed, lost and a life different to the one expected”. The sculptures we 3D printed from young people who are training for the 2016 and 2020 Paralympics. “This instillation, founded by Lynn Berry and Margaret Knight, was a three-year labor of love for thousands of volunteers. 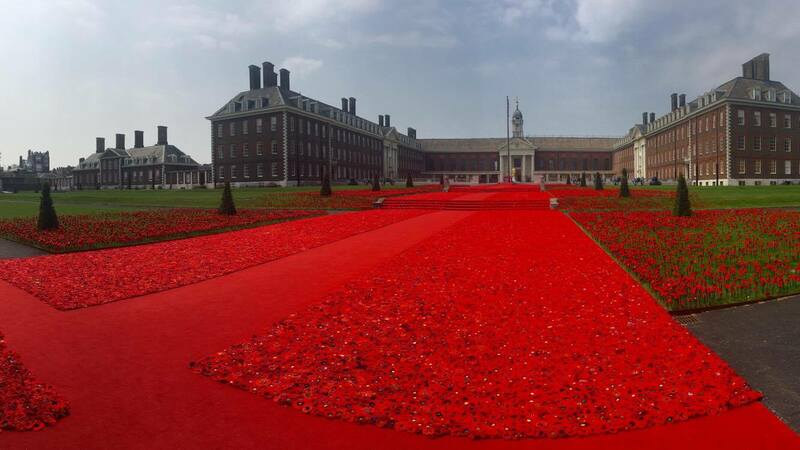 The project, consisting of 5,000 scarlet, handmade poppies, took over half a million hours of volunteer time to produce and is a spectacular acknowledgement of the sacrifice our servicemen and women, their families and communities make and have made. This instillation (which was described as “beguiling” by the show’s moderator for the judges, Tom Stuart-Smith) was truly breathtaking; spectators went from chitchatting and bustling to almost instantaneously becoming serene and humble when confronted by the impressive sea of red”. 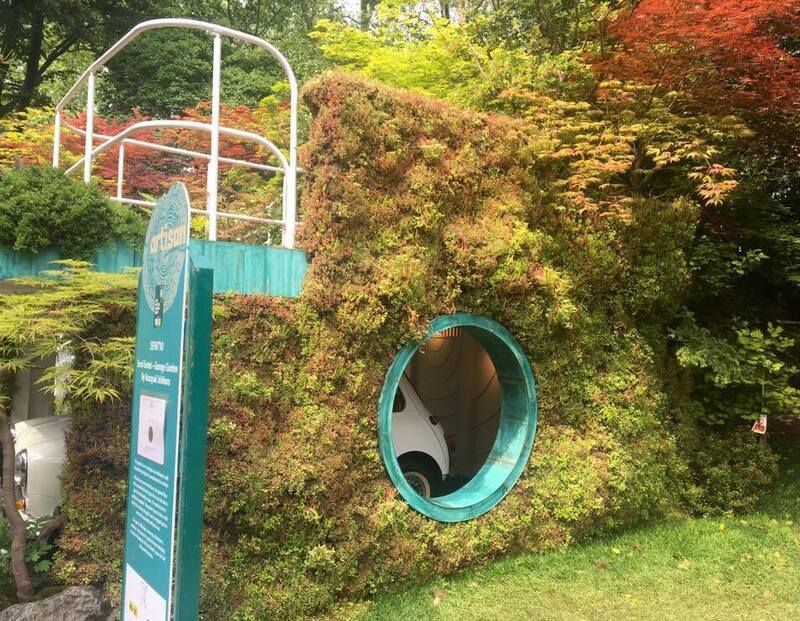 “This garden, in the Artisan section of Chelsea Flower Show, received a well-earned Gold medal. 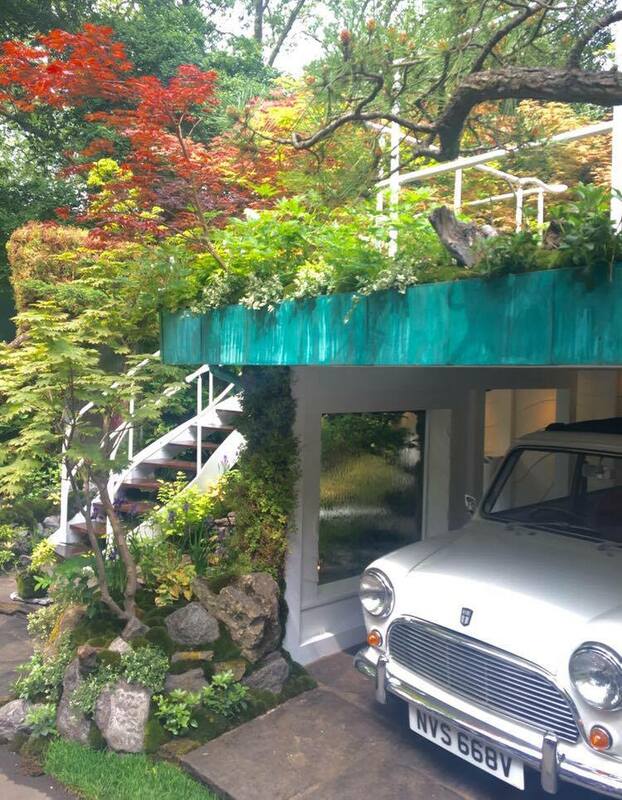 Designed by one of Japan’s best-known landscape artists and gardening personalities, Kazuyuki Ishihara, this two-tier structure was an impressive achievement. The ground floor offered “essential off-road space for a car”, but also a place for a family to relax. The roof-to tier was planted as a simple garden. Overall, the compact garden fused beauty with functionality seamlessly. I particularly enjoyed the blend of the natural (lush greenery, flowers, stones, grasses and a water wall) which was juxtaposed with a functional structure which considered the need to adopt innovative space-saving architectural solutions. I think that as our urban spaces become progressively more congested, we will see more structures like Ishihara’s”. 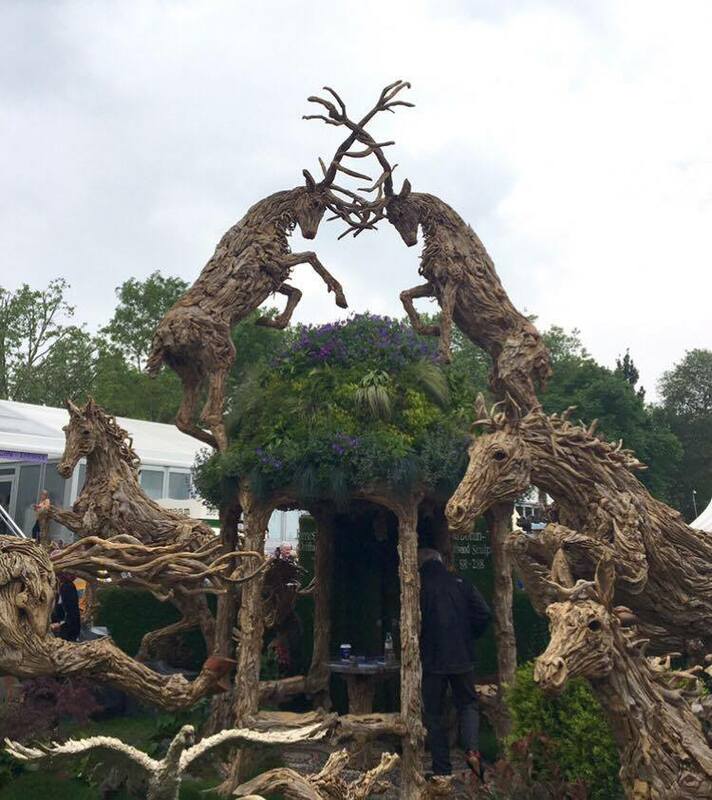 “James Doran-Webb’s driftwood sculptures were my favourite part of Chelsea Flower Show! Doran-Webb’s stand stood out like a beacon among every other stall at the show, not just because several of his sculptures were raised above the ground but because of their incredible ingenuity. ‘Reckless’, a sculpture of two ramming stags, was positioned on a gazebo called ‘The Temple of Ceres’. The attention to detail on to the temple structure was remarkable- the temple’s floor was laid with 8,420 pebbles in 6 different colours which resembled a traditional Celtic mosaic. I have to admit; one of my favorite works by Doran-Webb was his driftwood dog, (complete with cocked leg) which was ‘weeing’ up another of his sculptures, the ‘British Feral Goat’ positioned on top of several large, smoothed stones which wobbled (seemingly precariously). Doran-Webb even ensured the sculpture appeared as lifelike as possible by connecting the sculpture to a water supply. We were informed, by a exhibition assistant (I believe a relation of Doran-Webb’s, perhaps his Dad), that the sculpture had been coveted by a hysterical woman who persuaded her husband to buy it to put in their front garden, and was absolutely overjoyed. The sculpture certainly made a lot of visitors point, grin and laugh! Doran-Webb’s stand bought a touch of humor to the show whilst being completely flabbergasting. It was undoubtably my No.1 pick from thousands of sculptures, displays, stands and gardens at Chelsea Flower Show”. To sum the day up, despite the crowds and a LOT of walking, I really enjoyed my day at Chelsea Flower Show and can see why so many visitors flock from all over the world to attend each year. You don’t need to be a garden enthusiast to appreciate the colourful exhibits and unique stands. Furthermore, the excitement within the crowd is almost palpable, which makes for a great atmosphere. It’s also exciting to meet the brains behind the creations and chat with them in person; I didn’t expect this would be possible, but as visitors it made us feel very connected and informed. We definitely wouldn’t have understood the full meaning behind the gardens (and wouldn’t have fully appreciated the tenacity and hard work of the designers) if we hadn’t asked questions. I would certainly recommend speaking to them about the design, instillation and judging processes; it really is very interesting (they tend to be pretty honest). Next year, if you can, I would highly recommend attending (and make sure you bring cash for a refreshing glass of Pimms)!